1) It creates the background. 2) It creates the base and/or foreground. 3) It provides the GOBO for Negative Fill. 4) It determines the Direction of your Key Light. 1) I go out looking 2 to 3 hours before sunset. 2) I approach from the East looking West. 3) I'm looking for trees with a Glow--I want back-light--No Glow? Then the foliage is too dense. I don't want a dead background! 4) For group portraits I look for grass or sometimes rocks as a base. 6) On the Opposite side I want a large patch of open sky. (My Key Light). 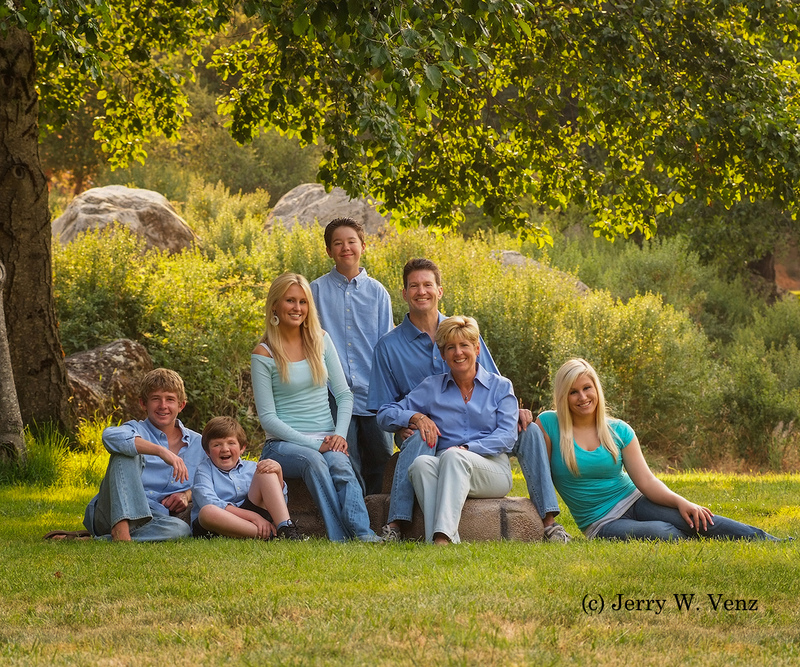 The key to making all these elements create great light on your subjects is PLACEMENT of your group. My primary rule for natural light portraits, taught to me many years ago, by the Master of natural light portraits, Leon Kennamer, using the subtractive method, is that, "THE LIGHT IS AT THE EDGE OF THE FOREST." Leon taught that being NEAR the forest gives us the best light and Open Shade for our subjects. If you move your subjects INTO the forest your light becomes blocked giving you primarily top light (creating "raccoon eyes") and closed shade. In my featured portrait below I placed this family of seven under the front edge of the canopy of that great tree to camera left. It was done on a clear day at the end of June at 6:30pm. It's obvious why I chose this location-that back-lit background and tree are gorgeous! What you don't see (but that is inferred in the lighting) are the line of trees & bushes at camera left (creating the shadow side on their faces.) their key light is from a huge patch of blue sky from camera right. In addition they are placed so that the back-light is providing each of them with hair light. I don't always get hair light on a whole group--my priority is good light on their faces--so this was a nice bonus! What I really like about this image is the three dimensional depth provided by this background. Not counting the tree, which has two main layers, you have three layers behind them--the bushes, the rocks and the out-of-focus trees in the deep background. This image was their pick for a large wall portrait and we used it for a display (24"x30") in our studio sales room. As usual, should you have any questions don't hesitate to shout out.